In March I have been asked to draw during a sermon on Ezekiel 33- The Watchman. I have been studying the topic of being a Watchman this week. What I have discovered is that we are all called to be the “watchman.” We are to be God’s messengers. We are to proclaim God’s message to the world. God has been calling us to do that since the creation of the world. God yearns for each of us to come to Him because we WANT to. He is not going to make us do anything. He wants us to come in love and willingness. The hard part of the message is that there are consequences for those who choose not to come to Him. For those who do come, there is an eternal reward awaiting them where they will live with Jesus Christ forever. For those who do not, there is the promise of hell. It’s just like being a parent to a child…there IS discipline and there ARE consequences! When your child talks back with a smart alecky attitude then the child gets disciplined ( or punished.) If they don’t get disciplined, they will keep doing it. If they keep doing it, eventually they will get into more and more trouble. However, when they are disciplined they quite often change how they speak to you and you earn thier respect. God wants our respect. He deserves it from us, just as we deserve it from our own children. After all, hasn’t He given us everything we could ever possibly want or need? Just like we have given our own children? I am not talking material gain here, but physical and spiritual needs. Basic shelter, food, water, etc. God yearns for our companionship the same way we yearn for our children’s and they yearn for ours. There is also a huge accountability factor to being a watchman. It’s like when we see a fire we yell “FIRE! EVERYONE GET OUT!” That is the warning to people that thier lives are in danger and they are to RUN from the danger as fast as they can! If we don’t yell “FIRE” then people will die in the fire. If that happens, then we are held accountable for NOT sounding the alarm!!!! The one thing I can’t figure out is why do people insist on staying in the fire? Are they deaf? Can’t they hear the sound of the alarm? Is the alarm loud enough? Is it long enough? Is it even going off? IS there an alarm? We are currently in the midst of a big snowstorm and I know we all heard the weather report and went to the store for milk, eggs and bread. The weatherman is our watchman. He has warned us of the storm. We have heard and responded. We are now prepared with our bread, milk and eggs in hand. God is also warning us to be ready through His Word. Are we responding? Do we have our spiritual food in hand? Remember- God doesn’t want our past-he desires our future! He wants YOU in it! 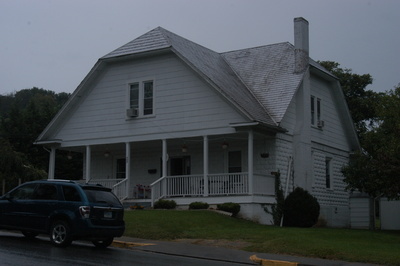 The Galax Hope House is a shelter that has been serving the needs of area homeless since 1989 when it was purchased by the Hostel of the Good Shepherd. For more than 20 years, a local place has kept its doors open for those with nowhere else to turn. Founded in 1987, the Hostel of the Good Shepherd has welcomed local and out-of-area homeless, giving them the opportunity to straighten out their situation and get back on their feet. Since 1989, the homeless have stayed at the newly-renamed Galax Hope House. Payne came on board as Executive Director in January and has taken an active role in renovating the house, located at 408 W. Center Street in Galax. The interior has been repainted, the porch has been repaired and a new handicapped-accessible ramp is being installed. New floors are in two rooms and new lights have been installed. Payne said the next steps include new kitchen and laundry appliances, as well as any other needed repairs and upgrades. The home is operated by the Hostel of the Good Shepherd corporation. Until last week, the Hope House shared the same name. Payne said the home is trying to raise awareness locally, which she said she feels will help its mission. That’s another reason for the name change, to help raise the home’s local profile. Payne said at any given time, 15 people can stay at the house and there’s room for single folks or families. Payne said from January to June, 28 people have stayed at the hostel for as briefly as a day or as long as the full six months. Payne said any potential resident has to undergo a strict screening process. She said the candidates have to be medically and psychologically stable and they have to agree to abide by the house rules, have nowhere else to stay, and be willing to work on finding a permanent dwelling and re-establishing their independence. Payne said the home gets referrals from different area agencies, ranging from hospitals to law enforcement and churches and several former residents have gone on to better themselves. Payne said donations are what keep the home going and anything, as long as it’s usable, is welcome. Recently, the hostel received $3,000 from the Diocese of the Good Shepherd and got two grants from DHCD. She said donations can be brought by the hostel or monetary gifts can be mailed to: Hostel of the Good Shepherd, 408 W. Center Street, Galax, VA 24333. Those who are interested in helping in any way can call 236-7573. ‘Cause I am down on my knees. In a daydream, I couldn’t live like this. I wouldn’t stop until I found something beautiful. No, I still won’t have what I need. I hope this song gives you a lift today! It has me! Are you ready for the fight? Are you prepared? God has been sending people from the beginning of time to “prepare the way” for us to meet Him! He has used unlikely people in unusual places. People who are on the “outside.” In following God’s call we often feel like an outsider, unpopular, different, weird, Jesus freaks, whatever! In God’s eyes, we are really the INSIDERS! Aha! We have the inside scoop on who God is and what His plans are for us eternally! He has given us a heart for his people. He is using us to tell his story. Remember when you were a little kid and your Mom or Dad would tuck you in a read you a bedtime story? Well, this is the same thing. God is longing to tuck us in, snuggle us up in his arms and read his story to us. It’s simple. A bedtime story with a beautiful ending, except this story is not a fairy tale. It is very real and eternally important. Who is in your story and what is your ending? I pray that God is in it and that it has an eternally beautiful ending! Take some time today to read HIS story! Hi!I am BACK! I have been in a funk but NO MORE! Satan has been trying his darndest to keep me down and out but I have news for you…I serve a GOD who will rescue us from any and everything! All we have to do is seek His face and ASK! Sometimes this is hard to do when we can’t see through the fog in front of us. Sometimes it takes God’s people to show you the way, to clear the path for you, to cover you in prayer, in discipline and in love. God provides the mercy and grace. I am so thankful for that ever flowing and abundant grace that God so freely gives us. 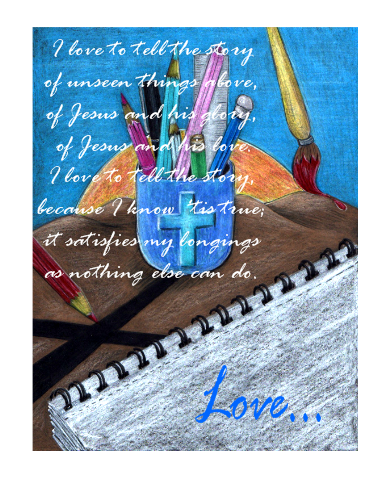 Thank you Lord Jesus!This drawing is all about telling the story…a friend recently said to me….”Donna, maybe you are supposed to draw thier story…” Well, duh on me! Why didn’t I think of that? Because I was blinded by sin. Anger, worry and Satan’s lies had overtaken me and like a fool, I let it happen. I was not awake! Well, I am here to say that I am fully awake and alive! I have spent the last week in constant prayer and fasting from certain things that were hindering my walk with Christ. I also had a prayer warrior who was doing it with me and that helped a lot. We challenged each other! 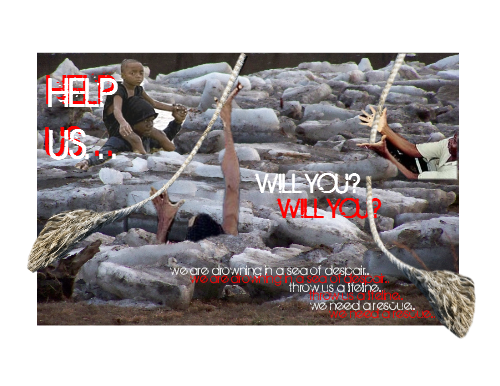 We all need an accountability partner here on earth however, our TRUE accountability partner is the LORD JESUS CHRIST. Not our friends, or our husbands, or even our Pastors, but JESUS CHRIST. He is right there all the time, even when we can’t see Him. If you are feeling like you are in a fog, seek out a prayer warrior to be your partner and be honest with yourself, them and with God. WITH GOD ALL THINGS ARE POSSIBLE!I put the words to the song ” I Love to Tell the Story” on the drawing. Why? Because I DO LOVE to tell the story and I want to thank my friend for reminding me of that!!!!! THANK YOU FRIEND!!!!!!! I love to tell the storyof unseen things above,of Jesus and his glory,of Jesus and his love.I love to tell the story,because I know ’tis true;it satisfies my longingsas nothing else can do. The Holy Spirit is at work…I can’t put the colors down! 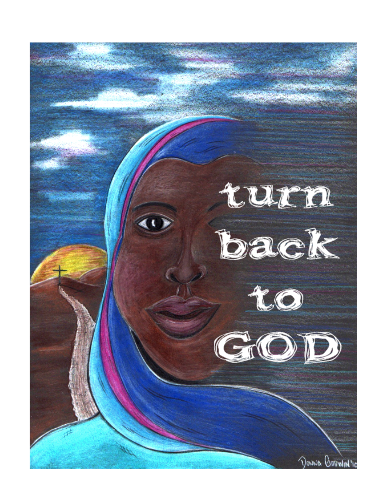 This piece was inspired by the first email from Dottie Diehl, in Haiti, where she said that we need to pray for Haiti to turn back to God…. it is eerie and hopeful at the same time. The cross is right there, behind the woman, all she has to do is turn back and see it with her eye that is open….follow the narrow road. If she doesn’t…she will slowly disappear from the face of the earth…which is what the right side represents. The quake, the oppression, the sin, the disappearance of God’s children. It is sad, so sad, yet at the same time it is a wake up call for all of us…each one of us to grab what is good and run to God as fast as we can. The hope is right there…waiting…bright and full of mercy and grace! Amen! I have been taking a break from a lot of things this week and one of the things I have realized is that I have been missing my “drawing time” with the Lord. I haven’t done anything in quite awhile and this week has proven to be quite therapeutic for me. I have turned off the cell phone, the facebook and other computer addictions that I have and have turned back to my precious time with God, my study, the Word, my pencils and my paper. How did I get so far off track? The world will sweep you up in a moment if you aren’t careful…it has me. My mind became obsessed with the problems of the world and instead of seeing the JOY that I have in knowing Christ, I was looking at the whole world, as I know it. It started with one thing, then led to another and another and another. I wanted answers and now. I am not very patient and I was being selfish. I wasn’t listening to GOD. I was listening to that little voice that plays over and over in my head…the what if’s, the should have’s, the why not’s, the how come’s. The shoulda, coulda, woulda’s. You know they are all related and are not from God. Especially when they cause you to question your faith, your spiritual leaders and God. A wise person told me today that Satan is a liar and a thief and we cannot let him have any hold on our life. We must submit to God in prayer and in numbers. We must not stand alone in our fight to win souls to Christ, to pray for one another, the world, our leaders, churches and yes, even our enemies. My heart has been broken for the people of Haiti. It is hard to watch the news, or to even begin to understand the devastation that they are facing today. I have dreamed, cried, prayed, dreamed more, and lamented over Haiti. The truth of the matter is that I cannot save them. However, I can PRAY for them. I have received several emails from a friend who has friends in Haiti and they have shared thier desire for us to PRAY for the country and for the people of Haiti to TURN BACK TO GOD. I have no earthly understanding of the power of prayer; however I DO believe in it! I have experienced the power of prayer in my own life as well as others. I don’t think we have even begun to tap into the mighty power that God has given us through this means of communication with Him, our Almighty Creator. Can you imagine what would happen if the multitudes of believers would come together in fervent and ardent prayer, all at once ,the world over? WOW! The thought of that gives me goose bumps! 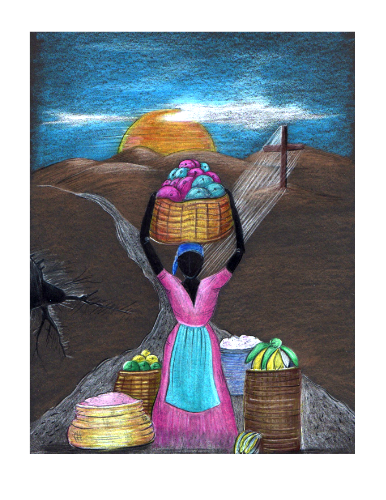 So, my drawing is to remind us to pray for Haiti and her people. This drawing is called “The Offering.” There is a song that has a line that says, “there is pain in the offering” and there is…at the other end of that pain is the complete and beautiful JOY of Jesus Christ. He is our HOPE, especially in these times of turmoil and destruction of the earth. Creation is groaning under the sin of the world and I believe the earth wants to be regenerated and made new just as much as we do! In this drawing the woman is bringing all she has to the Lord as an offering. That’s what He requires of us and until we understand that, we will never be satisified with what the world has to offer. She is offering even in the destruction. Arms high overhead, baskets full of fruit and grains. The fruits of love, joy, peace, patience, kindness, gentleness and self control. The light of Christ shines upon her as she places her offering before God. God will bless her obedience and offering. 28Meanwhile, the moment we get tired in the waiting, God’s Spirit is right alongside helping us along. If we don’t know how or what to pray, it doesn’t matter. He does our praying in and for us, making prayer out of our wordless sighs, our aching groans. He knows us far better than we know ourselves, knows our pregnant condition, and keeps us present before God. That’s why we can be so sure that every detail in our lives of love for God is worked into something good. We pray fervently for you Haiti and the children of God. Hi! This is a picture that I took on Tuesday evening of the river at Billsby. I have never seen anything like this before and it reminds me of Antarctica! As I was taking pictures of this I was fascinated by what I saw there. 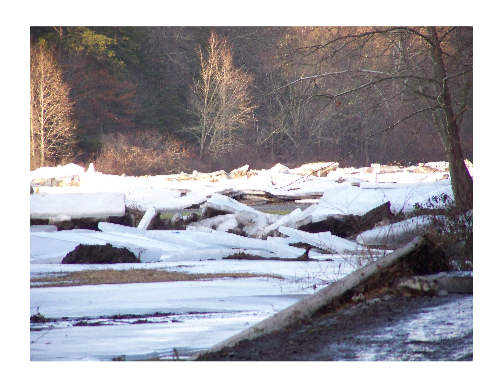 We couldn’t get too close as the ice had crept up onto the road and it would have been dangerous to go any further. 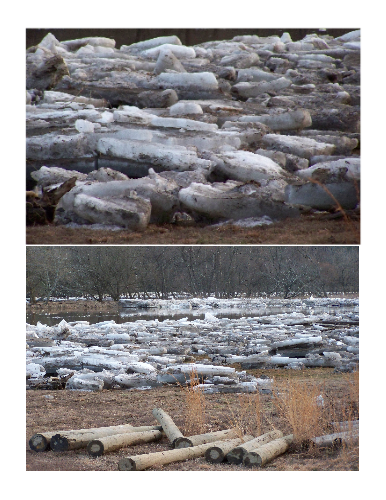 So we turned around and went to Fries to see the ice on the dam there. This is what we saw at Fries. This next picture is what my mind sees. It is graphic and one that I cannot get out of my mind. 11-13Scripture reassures us, “No one who trusts God like this—heart and soul—will ever regret it.” It’s exactly the same no matter what a person’s religious background may be: the same God for all of us, acting the same incredibly generous way to everyone who calls out for help. “Does anyone care, God? Is anyone listening and believing a word of it?” The point is: Before you trust, you have to listen. But unless Christ’s Word is preached, there’s nothing to listen to. To my prayer warriors..I love you! Jesus tell me again what’s it gonna take to sink in that you’re my one reason…. thank you ladies…I love you!